A few months into this project, I upgraded from Poser 7 to Poser 9. One of the new features of Poser 9 was a new skin rendering model called Subsurface Scattering, or SSS. It is a form of Ambient Occlusion. If you don’t understand this stuff, well neither do I. All I know for sure is that it can sometimes make pictures look better. But it is tricky. The worst SSS images I have seen makes the skin look ceramic, but washed out and pale skin is common too. While the skin detail is there, the color looks off, and that “ceramic” look creeps in too. It is not just about applying the skin model to any skin, it has to be the right skin and tuned to use SSS model. Well I found just such a skin on Renderosity. The name caught my attention first, but then I noticed how close the the skin is to the one I am using for Ariane already, and it is already pre-tuned to work with SSS. 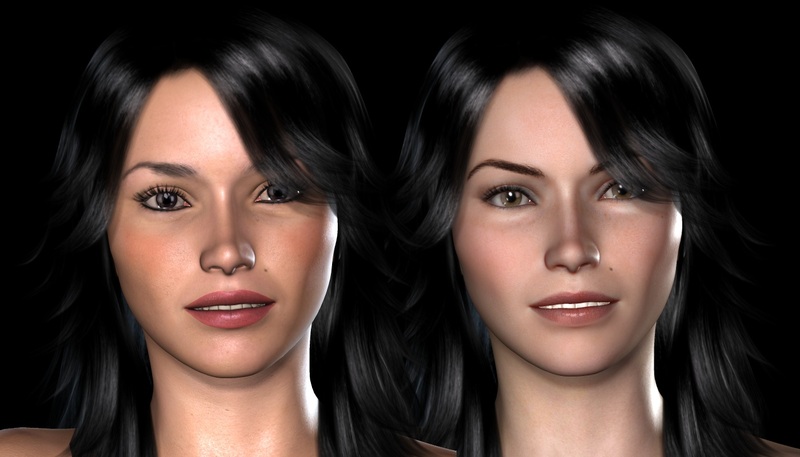 The application of the skin to Ariane’s model resulted in the picture on the right at the top of this post. The one on the left is the non-SSS model. When I posted that comparison on Facebook, the vote was overwhelmingly in favor of the right picture over the left. I agree, but that means re-rendering a lot of pictures. I think it might actually be worth it though. Its All About the Lighting! Ariane isn’t the only major character I tried this skin trick with. The Paula character seemed a prime candidate as well, because the skin I was using was a weak point already, not to mention the hair style wasn’t working either. So I found a similar SSS enabled skin for her too, and a better hair style. Since there are a lot fewer Paula pics to redo than Ariane pics, I started rerendering Paula first. Most of the time I just swapped out the hair and skin and rerendered, which usually works out OK, until I got to a series of pics that take place in an office. As you can see on the left, the old hair and skin looked OK in the office lighting, but I was trying to make it look better. When I just swapped out the hair and skin and re-rendered, it actually turned out worse, as you can see in the center. The secret to improving on the original was to adjust the lighting in the scene, resulting in the much better pic on the right. I have a feeling this is going to prove true when I get to redoing the Ariane pictures. (Side note: I was planning on redoing a lot of the Ariane’s anyways as in my rush to do her story, I noticed she has a bit of an acting problem, having the same expression on her face in 80% of the pictures. Re-rendering is not going to be a pointless chore). Since Ariane and Paula worked out for the better, why not improve Rachel too? Well after trying the same techniques to Rachel, the results are: the non-sss Rachel actually looks better! New technology does not make everything better. The SSS Rachel on the right looks flat and uninteresting. The one on the left may look less “real” but it has more character, which is especially good because there are an awful lot of Rachel pics that I did not want to re-render. Ariane V4.1(?) actually looks a LOT like the original! The slightly paler complexion makes quite a big difference. Another thing I’m noticing is the more recent pics of Ariane seem to have picked up on her body language again. Tilting her head slightly and that cute half-smile are both Ariane trademarks and that helps seal the idea that this is just an update of Ariane rather than a different person. Looks awesome! Have you tried Poser 9’s indirect lighting yet? It is a huge improvement over P7 lights.